Teachers have met Dundee City Council officials to make alternative arrangements for pupils after a massive fire at a secondary school. More than 50 firefighters worked through the night to tackle the blaze at Braeview Academy in the city. Arrangements are being put in place for the school's 570 pupils, who will remain home for the rest of the week. At its height, nine crews attended the incident in the Whitfield area of the city. 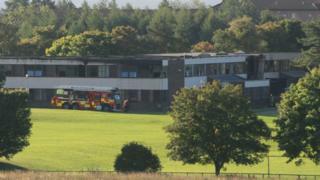 A spokesman for Dundee City Council said: "The damage to Braeview Academy following last night's fire is still being fully assessed, but it is clear that the building will be out of commission for some time. "We are determined to minimise disruption to the pupils' education, and are looking at all the options available. Within hours of the fire, discussions were already taking place with a focus on short-term measures to get the young people back in classrooms." Staff are currently creating a timetable for the coming weeks, using other school accommodation in the city. Braeview pupils will remain at home for the rest of this week and into next. The spokesman added: "Please be assured that we are doing everything we can to resume their classroom learning as soon as possible. "We are grateful to the school's 80 staff for the part they are playing at what is a very emotional time. A meeting was held with them today, and we will continue to work closely with them in the coming days. "The staff, the young people and the wider residents of the area form a tight Braeview community, and that spirit and resilience will be more important than ever as we pull together for the benefit of our pupils after this sad incident. 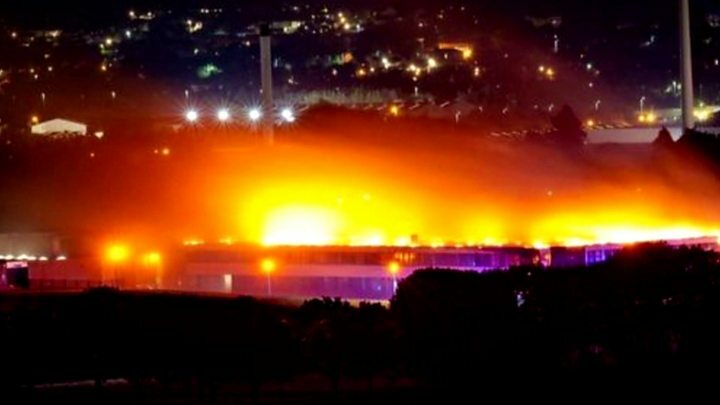 Emergency services were alerted shortly after 21:30 on Tuesday to reports that the building was alight. A fire service spokesman said that when they arrived, fire crews found a "well-established fire". Pictures posted on social media showed the building engulfed in flames. One fire crew remained at the scene on Wednesday to dampen down the site. Dundee City Council said that an assessment would be carried out to determine the state of the building.